There are several accounts in the Gospels (Matthew, Mark, Luke, John) of Jesus giving sight to the blind. Two blind men were healed (Matthew 9:27-31). A blind, mute, demon-possessed man was healed by Jesus (Matthew 12:22). Two blind men near Jericho were given sight (Matthew 20:29-34). It may be that the blind beggar named Bartimaeus was one of these (Mark 10:46-52). A blind man was brought to Jesus at Bethsaida and healed (Mark 8:22-25). The man who was blind from birth, and was told to go wash in the pool of Siloam in Jerusalem (John 9). When you had your cataract surgery I thought it was minor and routine. When I had mine it was more serious! Actually it was not too difficult. I can tell that I see better in the right eye, but I must wait a couple of weeks to see what will be done about the lens I have been wearing before I will know how effective it has been. And then there is the left eye. Well, all of this got me to thinking about the miracles of Jesus in the healing of the blind. One of the physicians at the clinic where I go has a nice piece of sculpture in his waiting area. 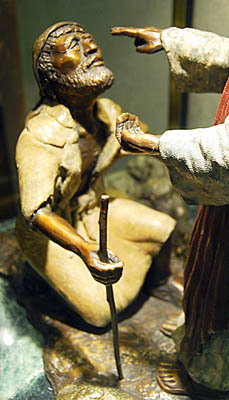 I suspect that this sculpture is based on the account of the blind man in John 9. It could possibly be the account of the man at Bethsaida (Mark 8). I had the opportunity to meet Pixner once at Tabgha and have him autograph a copy of his book. I asked him if he knew how long the marker had been at the site. He told me exactly and then added, “I put it there.” You might like to see that memorial stone. 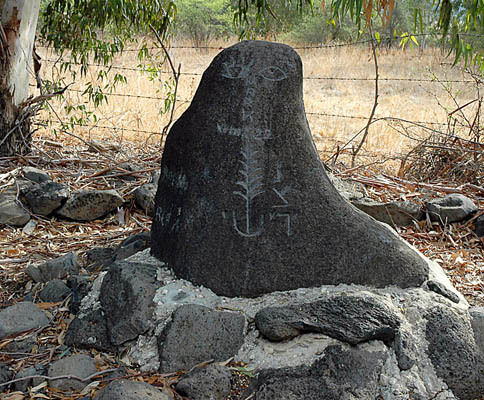 Memorial stone placed at Bethsaida by Bargil Pixner. Photo by Ferrell Jenkins.